Charter Flight Group is a private jet company specializing in securing private jet charter for businesses, individuals, and groups to and from Bob Hope Airport in Burbank California. Whether you are traveling for business or pleasure, we can arrange private air travel flights tailored to your particular needs. You can rely on our thirty years of flying in and out of Bob Hope Airport to get you to your destination safely and comfortably. The executive charter flights at our disposal can accommodate any number of people who plan to travel. With access to thousands of private jets and hundreds of models, classes and styles, we can help you easily plan your air charter flight. With access thousands of airports around the world, Charter Flight Group specializes in getting you where you want to go on time in the latest charter flight aircraft available. From our turbo prop jet planes such as the Saab 2000 and the Jetstream 41 to the Boeing 727 VIP charter airline, you will enjoy a luxurious flight to wherever you need to fly. We can also arrange for lighter charter planes like the Eclipse 500 and the Citation V, mid-sized charter jets like the Falcon 20 and the Hawker 4000, or heavy charter jets like the Global 900 and the Legacy 600. We can even secure one way or empty-leg charter flights. Just tell us what you need and we will prepare an air charter flight quote based on your budget and your itinerary. Renting a private jet flight to and from the Bob Hope Airport (BUR) in Burbank has many benefits. You don’t have to waste time standing in long lines at security checkpoints, and on a private jet flight you have the privacy to discuss business plans or to visit with friends and family. Traveling on a charter air flight is efficient, enjoyable and convenient. Charter Flight Group strictly adheres to the Federal Aviation Administration’s (FAA) Part 135 standards for aircraft maintenance, operation and licensing. In addition, we insist on third-party safety auditors for each airplane we secure. We make these additional safety inspections a requirement for all the global partners with which we work. The Aircraft Research Group of the United States (ARGUS) and WYVERN are utilized for the extra inspections because of their high level of expertise. 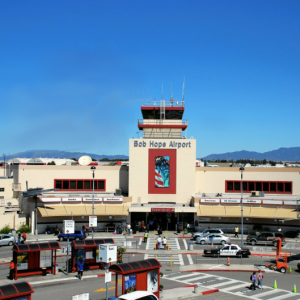 The Burbank airport has had many different names prior to becoming the Bob Hope Airport in 2003 – Angeles Mesa Drive Airport, United Air Terminal, and Burbank-Glendale-Pasadena Airport — to name just a few. In days of yore, flight attendants (called stewardesses until the 1970s) were nurses. The idea behind this was to make passengers feel safe and secure during the flight. The nurses also handled the baggage and helped pilots push the planes into their hangars.Although times have changed, the Bob Hope Airport remains relatively small. Under existing development agreements, the airport cannot expand its gates or terminal until after 2015. 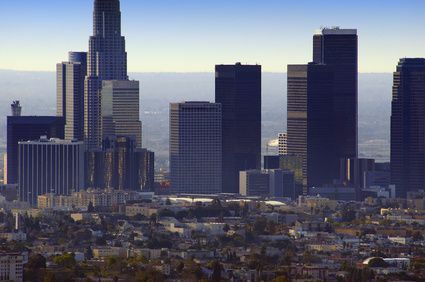 Over two million passengers board planes each year at the airport, which is just a few miles from the business district of Burbank in Los Angeles County. Covering 610 acres of land, it has two asphalt runways. There are many places to stay in close proximity to the airport. This can be an important factor for some business people on our chartered planes who have little time to spare. Among the choices are the Marriott Hotel Burbank Airport, the Hampton Inn & Suites Burbank Airport, and the Courtyard by Marriott hotel Burbank Airport. Vacation travelers on our private jet to Burbank have easy access from the airport to a variety of lodging, attractions and entertainment. Popular tourist stops are Warner Brothers Studios VIP Tours, the Tonight Show with Jay Leno, the Marital Arts History Museum, the NBC Burbank Studio Tour, DeBell Golf Course, and the George Westmore Library and Museum. Why Choose Charter Flight Group for your Jet Charter to Burbank? If you want a chartered flight with a private jet agent that has a perfect 100 percent safety record, then you should choose Charter Flight Group. In addition to our notable safety record, know that you will be in the confident hands of highly experience pilots and that all of our maintenance personnel are screened and certified. No matter where you want to travel, whether it is to Burbank or to any one of thousands of other airports worldwide, you can count on our chartered flights to get you there safely, comfortably and on schedule.